There is an old adage that goes “When Life gives you Lemons… Make Lemonade”. If you have kids you know that you are going to be drinking a lot of lemonade because life comes at you from unexpected directions all the time. It might involve having to run all around town late one evening to look for a blue T-shirt that your kid needs for the assembly at school the next day. Or it might be baking those 36 cupcakes at 11pm at night because your kindergartner is supposed to bring the snack the next day and they LOVE your cupcakes and only your cupcakes (store bought cupcakes just won’t do). There are also the unplanned events in your life that require you to think a little bit out of the box and re-frame your point of view. 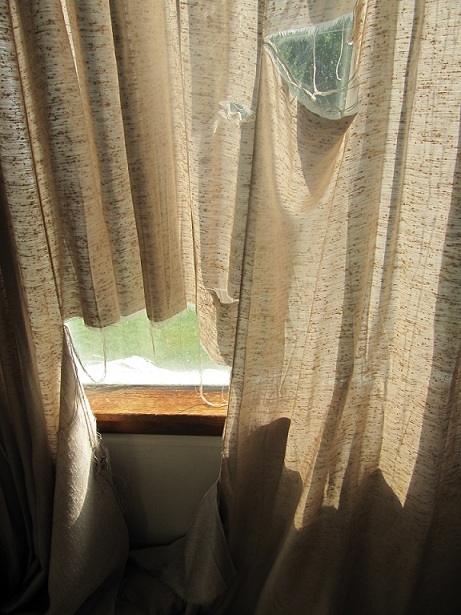 For me that came in the form of ripped curtains. We have a new puppy in our house. By puppy I mean a two year old big dog that is still in puppy mode. So, technically she is more of a toddler. She is in her Terrible Two’s. And her name is Zilla (short for Godzilla). This summer we put a new area rug in the living room and we have been training her to stay off the rug. The kids put a dog bed by the window so that the Puppy could still be in the room with us but would know where she was supposed to be. This was working out great. Unfortunately, she still gets very excited (as puppies do) every time a car drives by and jumps up to peak out the window. This has resulted in a couple of pretty good gashes in the curtains. Point of Reference for this story: Not only do we have a puppy but we also live in a gigantic “fixer-upper” and we are 10 years into a 20 year project. New curtains were not on the To-Do list for this year. By mid September the curtains were pretty ghastly. But what do you do? We re-framed the point of view and have declared them “Halloween Decorations”. Of course this does put us in the position of having to deal with the curtains around November 2nd. But at least it has put that expense off for one more month giving me time to shuffle the To-Do list a bit. Now you’ll have to excuse me while I get back to my lemonade. Everything in this post is true – it was not something I had initially intended to share with the world. I have not received any promotional material or sponsorship for the posting of this mom moment. Let’s face it – those curtains are really terrible and even calling them Halloween Decorations is a bit painful. The post was inspired by my friends at Lifetime Television’s Balancing Act who shared a link with me this morning to an upcoming segment they are planning featuring the Official Curtain of the National Sleep Foundation, SoundAsleep™ Room Darkening Curtains that will be appearing on The Balancing Act on Oct 24th & Nov 21st. You know for sure that I will be tuning in to watch the Balancing Act on the 24th. In the meantime, you can check out the SoundAsleep sweepstakes facebook page right now.